We’re proud of our coffees and the people behind them. With Coffee Circle we want to promote understanding and appreciation of good coffee quality and we want every single cup to reflect our dedication to excellence, performance, and respect. To this end, we’ve defined 7 criteria that we’ve set as our goal when purchasing our green coffees. We are currently working intensively on transparent processing of data and detailed figures. Do you have any questions? Then write an email to martin@coffeecircle.com. Our coffees can be traced back to their origin so we know exactly where they come from. The traceability of our coffees goes beyond the country and the region. When we say traced back to origin, we mean exactly which cooperatives our coffees come from. Traceability is actually one of our easier criteria to implement. However, it can happen that we have to buy additional coffee due to an emergency. For example, if a component of an espresso blend runs out, we have to make a ‘lateral purchase’ so as not to halt production. In this case, the origin is then no longer 100 % traceable to the cooperative and usually ends with the country and region. The last time this happened to us was in 2014 and we continue to strive to keep all our green coffees 100 % traceable. Our coffees come from direct trade relations. This means for us that we communicate regularly with our partner producers and visit them annually. Direct communication is essential to building mutual trust, improve coffee quality, and to really understand local living conditions. With the expansion of our portfolio, it has recently become more difficult to visit all our partner cooperatives every year. The coffee countries are far apart and the coffee harvest often takes place at the same time of year. In addition, we don’t just want to make drop-in visits and leave again after a few hours. Nevertheless, we’re sticking to our goal and our challenge in the coming years will be to expand our ‘Green Buying Team’. Ideally, we can then spread our visits among team members and be present in several countries at the same time. By doing so, we can continue to add new countries of origin to broaden our taste selections without compromising our criteria. Direct communication is essential to building mutual trust, improve coffee quality, and to really understand local living conditions. High coffee quality is important to us. 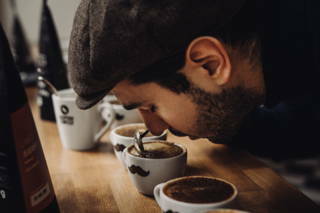 We only buy filter coffees that have a Cupping Score of > 80 points (international scoring model of the SCAA, the Specialty Coffee Association of America). The Cupping Score is a trusted reference for evaluating the quality in the purchasing process and is a proven and reliable process in the speciality coffee trade. We continually motivate our partners at the source to improve coffee quality. This structured method of the SCAA has tradition and merit in the purchasing process of speciality coffees. Nevertheless, to a certain extent it remains a subjective assessment of the respective grader. Therefore, we always try to use the opinion of two graders in „blind cuppings“ to assess the quality. In any case, you can absolutely rely on the fact that we only buy coffees whose quality comes with our total confidence. For high quality we’re prepared to pay high prices, independent of the world market. For us, farmers getting a high price means they are motivated to continuously improve their coffee quality and the higher income from coffee cultivation leads to the continuation of the improvement of overall living conditions. For example, in recent years, the average purchase price we’ve paid in Ilketunjo (Limu region, Ethiopia) is 88 % higher than the world market price and 56 % higher than the Fairtrade minimum price of EUR 1.60 (including premium). As nice as this comparison is, we know we’re comparing apples with pears here. The world market price is based on a price basket of all traded coffees in the world. This means that on the one hand it is made up of all quality grades, not only top qualities like ours, and on the other hand of coffees from many different countries, which in turn have very different cost structures in cultivation: it makes a significant difference whether the coffee cherries are picked by hand in forest gardens or mechanically on plantations. Nevertheless, we see a meaningful indicator in the comparison but understand it only as the beginning. As complex as the topic is, it’s important to us that it’s transparent for you. Our challenge in the coming years is to learn more about the cost structures of our production partners in order to really evaluate how fair our prices are. We’ve already achieved success in Colombia thanks to our high purchase prices. Thanks to quality premiums paid in addition to the purchase price, our partner cooperative COOCAFE was able to finance a Quality Lab to improve the coffee quality of the farmers cooperative in the long term. Farmers getting a high price means they are motivated to continuously improve their coffee quality. The higher income from coffee cultivation leads to the continuation of the improvement of overall living conditions. 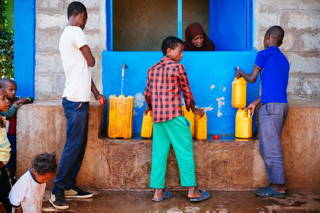 We implement projects in local communities with long-term partners. We see long-term partnerships as an additional incentive to improve coffee quality and as part of the remuneration package. In this way, we differ fundamentally from a classic charity, as we aim to motivate through economic incentives. 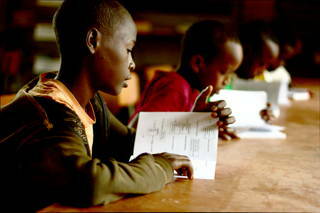 We see this as a much more dignified form of support than what we have encountered in classic donation models to date. Currently, with each cup of coffee you support one of our two projects in Ethiopia – either the WaSH project through which we provide more than 18,900 people with access to clean drinking water, sanitation, and hygiene. 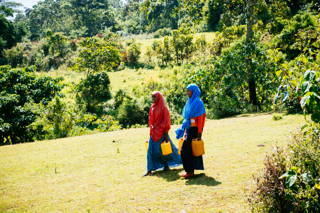 Or the Value Chain project which supports more than 10,000 coffee farmers on receiving a higher income through coffee. 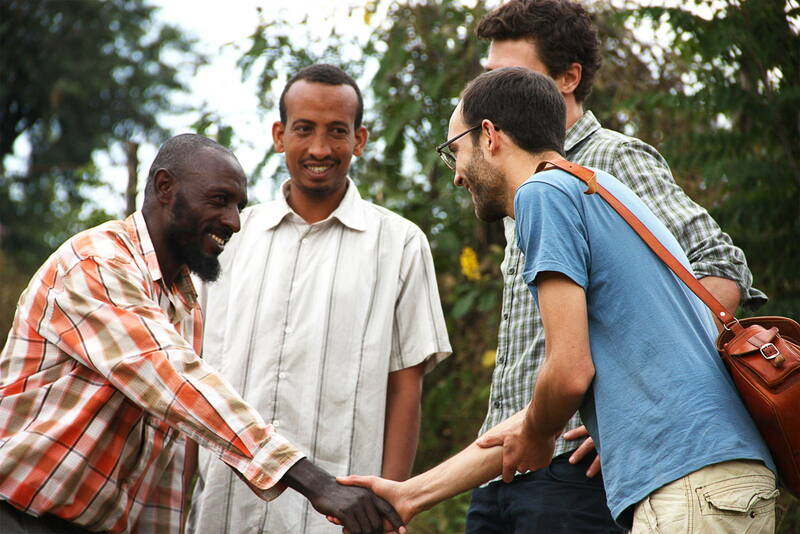 We are currently focusing our project work on partner cooperatives in southwest Ethiopia. Although we also implement smaller projects in Colombia, we’re currently investing the most money in our WaSH and Value Chain project. It is important for us to invest collected funds in such a way as to maximise positive impact. In Ethiopia, for example, we’re primarily fighting fundamental problems in basic services, such as elementary education or lack of access to clean water and the accompanying hygienic diseases. These are not the same problems faced in Colombia, for example. Here again, our goal is to improve the coffee quality and productivity of our partners by investing as effectively as possible in training coffee farmers so they can in turn increase their income. Our goal remains to pay a fair price to all our partners and to implement additional projects for long-term partners. In the coming years, we have set ourselves the goal of increasing projects in coffee cultivation. Firstly, because basic services are not a problem everywhere, but more importantly, because we view investments in coffee quality and improved production structures (e.g. in more professionalised accounting) are most effective for securing and boosting income in the long term. Our coffees are grown in an environmentally friendly way. This is, independent of a certification, a purchase requirement for us. We expressly welcome the official organic seal but quality ultimately plays a greater role for us than official certification. That is why we also buy non-certified coffees, provided we’re sure that the coffee is grown in a sustainable and environmentally friendly manner. In reality, it’s very difficult to verify sustainable farming practices. It requires a great deal of trust in our producer partners, as we cannot check the extent to which chemical fertilizers, for example, are used all year round. Greater presence and better relationships will certainly help here, see point 2, and certifications also play their part in reminding producers of organic farming methods. However, certifications are also based solely on an annual survey and control. And especially in Ethiopia, based on our personal experience of recent years, we have our doubts about the extent to which organic certifications are truly consistent and then adhered to. But with better presence and an ear to the ground we can only improve. The coffee trade is complex and we have learned in recent years that nothing is cut and dried. Rather, we must constantly learn, think outside the box, and regularly review our purchasing criteria to ensure high quality, fair trade and sustainable cultivation wherever possible. We would like to strengthen our „Green Buyer“ team to increase our presence in the growing countries, to intensify our personal relationships (point 2), to better understand high and fair purchase prices (point 4), and to ensure sustainable cultivation (point 6).